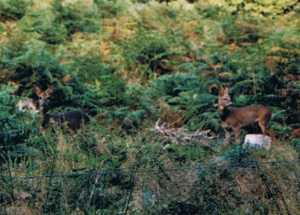 Observation - Deer - UK and Ireland. Description: Remarkably unconcerned by my presence until the shutter clicked! Watched for about 5 minutes before this, taking Simon King's TV advice of not staring straight at them. Remarkably unconcerned by my presence until the shutter clicked! Watched for about 5 minutes before this, taking Simon King's TV advice of not staring straight at them.